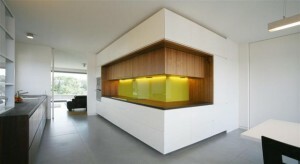 All about Contemporary Kitchens design, designers, cabinets and remodeling. Strato 031 – Marco Gorini did it again! 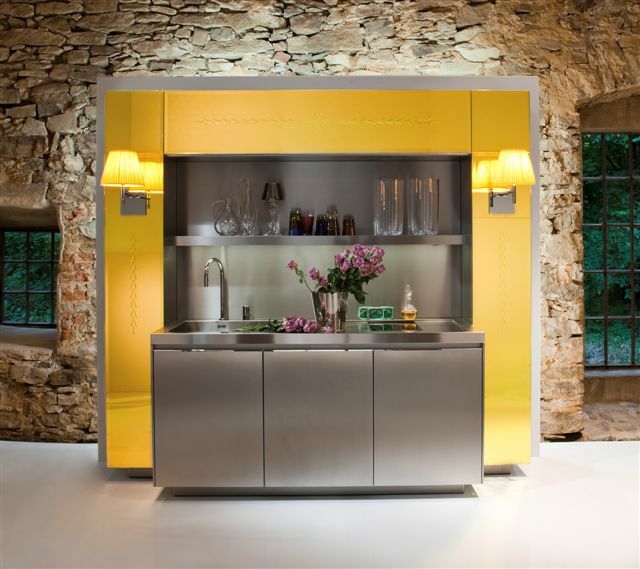 One of my personal all time favorite kitchen designers is Marco Gorini – at the Milan Design Week, in 2009, Gorini has done it again. 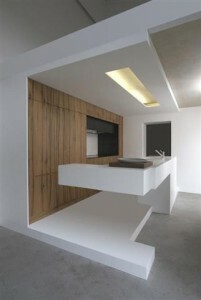 He introduced the Strato 031 concept – another great kitchen design with a new twist. In the Strato 031, Gorini searched for unique designs, combined with the use of very unique materials. Besides to stainless steel and stone, he used rare and precious fossil durmast oak – the unusual wood, which isn’t originating from deforestation but rather form the subsoil, fruit of the course of nature which gave it its special smoky look. Strato 031 is made up of two units: a pantry area, against the wall and an island that is also doubling as a table. 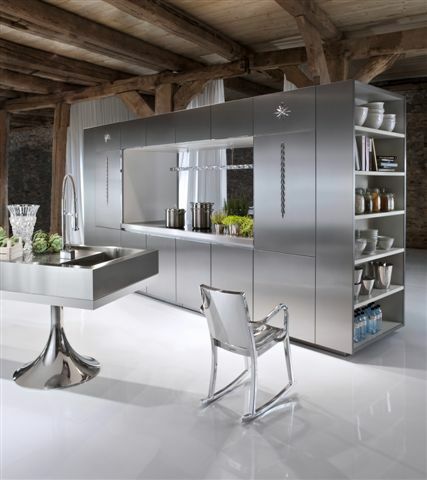 The tall unit (pantry) is made up of a satin finished stainless steel structure, with integrated fossil durmast oak doors. The two central doors are fitted out with foldaway opening (pocket doors) and integrated electrical appliances. 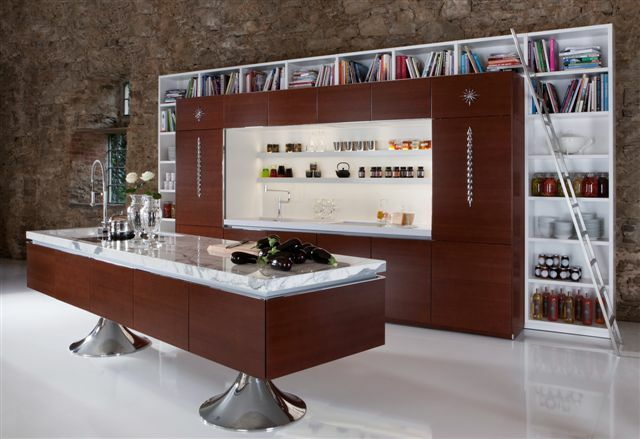 The two side pantry cabinets are used for storage – their interior structure is finished in brown stone and the shelves in glass. According to Strato – the finishes and the luxurious touches must not be found only in the exterior parts, but also on the interior parts that may be seen only by us. 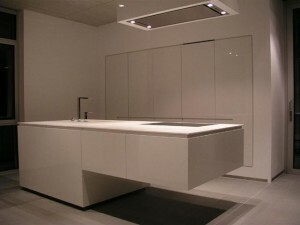 The island is special and complex, both in terms of its appearance, as well as its functionality. 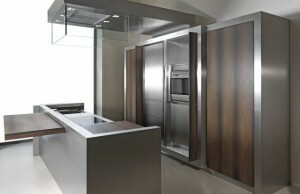 Stainless steel structure, covered top and fronts panels in fossil durmast oak and stainless and wood interior to match. 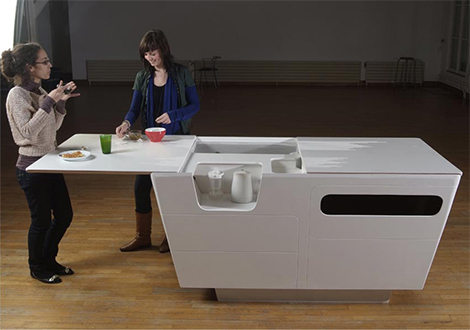 The worktop is covered by three panels – two of them are sliding and allow access to cooking and washing area (note the special folding faucet that allows that). 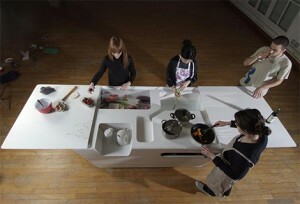 One of the panels becomes a table, when pulled out. 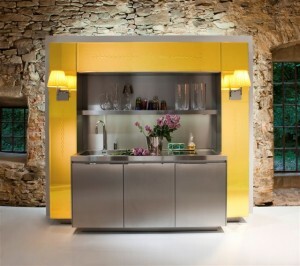 After European-Kitchen-Design.com was the first to report (Sept. 12th, 2009) about the new Philippe Starck kitchen line/brand, that will replace the Miele brand and the reasons behind the change, we now have images of the new collection. The AFG Arbonia-Forster Holding AG together with the Warendorfer Küchen GmbH published a press release on the 23rd of September making the announcement official. 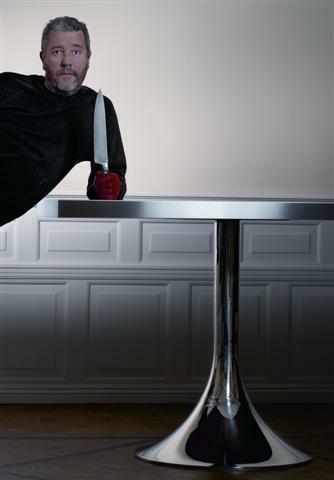 A preliminary presentation of the Philippe Starck design organised by Warendorfer Küchen GmbH for the retail advisory committee prior to the brand name change was greeted positively: “Sales-led design that will appeal to a broad range of customers.” The basic message of the event in Bielefeld was clear: A new force is emerging from Warendorf and is also called “Warendorf”. We do not publish opinions and always remain neutral – we just report about industry news and design trends – what do you think about this new product line? You Never Know What You’re Gonna Get!” – I love surfing the web and finding some really cool sites, on the other side of the world. Discovering companies and products that I would have never found any other way. This time, I discover a really cool site, with very little information about the company (I’m guessing in Germany they don’t believe in web sites that have ‘About Us’ section…), but still I couldn’t skip this one – somewhere in Germany, near the boarder with Luxemburg, is this company that seems to be a custom wood shop (they also have an office across the boarder in Luxemburg). The name is Unikat. kitchen, with high-gloss lacquer fronts and Corian, hidden worktop and electrical equipment in flush-mounted built-in cupboards. 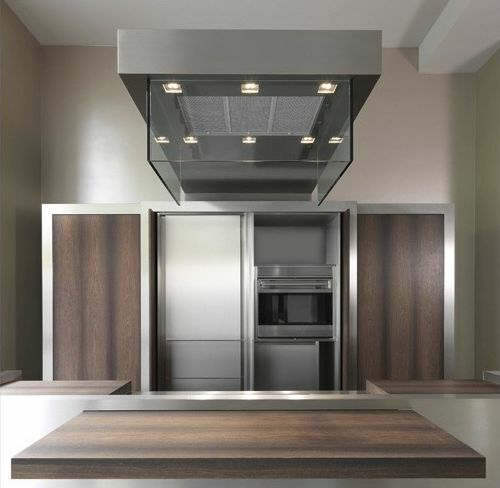 If you are thinking of a contemporary kitchen remodeling and are looking for inspiration, this just may be the web site you’ve been searching for. Obviously, the cabinets alone will just not give you these wonderful designs – the designers and architects that are responsible for these wonderful creations, have combined the contemporary cabinetry with the right contemporary appliances, contemporary kitchen faucets and sinks, to create the perfect picture contemporary kitchens. But they don’t just do kitchens – lots of contemporary custom cabinets for various uses – other then contemporary kitchen cabinets, (with really great contemporary concrete kitchen countertop) they also feature contemporary bath design, contemporary commercial woodwork and even contemporary furniture pieces. All the spaces are very contemporary interior design settings and just simply some of the coolest contemporary designs I’ve seen recently. 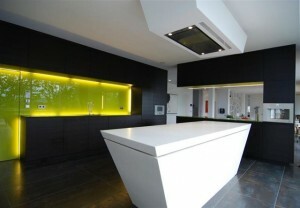 Did I mention these contemporary designs? Thanks to the great people at momoy.com, I found this great kitchen island. Do you live in a small space, love contemporary kitchen cabinets and are looking for Kitchen design ideas, on how to get everything to fit? – look no further! Ideal for contemporary, compact homes and sleek city condos or lofts where space is at a premium, the space-saving mini kitchen design by Ensci is the latest and greatest urban home must-have and one of the best modern kitchens around. This modern mini kitchen looks cool, and is convenient by putting everything you need for your culinary creations right at your fingertips. It is surely one of the best kitchen ideas I’ve seen recently. 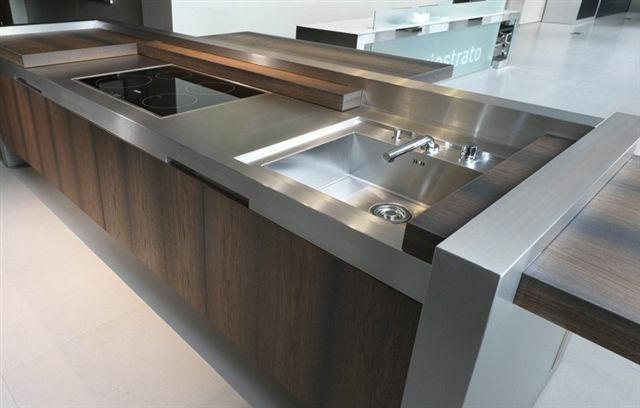 These innovative kitchens feature a variable design with a movable countertop/tabletop that slides open to reveal the range, sink, storage, cupboards and kitchen cabinets – all in one ultra-modern piece. When not in use, the kitchen closes up; giving a minimalist, streamlined look and some much-needed organization to what is the most-used, most-chaotic room in the home. 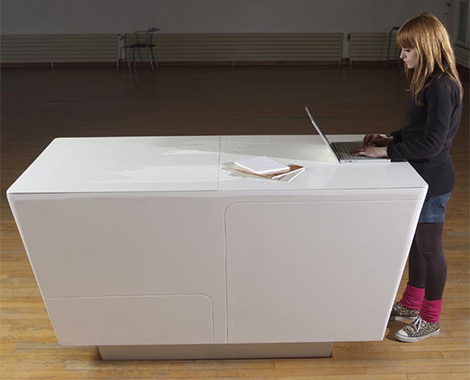 Check out these futuristic mini designs by visiting Ensci. I don’t think that this kitchen island (when available commercialy) will be priced like one of these IKEA kitchen islands, but if all the usual kitchen designs are just not cutting it – this maybe your answer – ready to start your kitchen remodeling?